Let us promote your website on all major Portuguese Search Engines! In order to be featured on Portuguese search engines, it is necessary that your website is localized in Portuguese, either partially or entirely. Portuguese website localization refers to the process of translating your current website into Portuguese, conducting Portuguese keyword analyses, implementing Portuguese SEO, and integrating the localized Portuguese pages onto your website so that you can have eligibility to rank on Portuguese search engines. Our work speaks for itself! Our clients rank on the first page of Portuguese search engines with their industry’s most competitive keywords. Let us show you how Portuguese website localization can position your website on Portuguese search engines! Contract our Portuguese experts to create an entry page, multiple pages, or a full-website translation in Portuguese for your website optimized with your Portuguese keywords/meta tags. As a multilingual SEO company, our primary focus is to deliver culturally and semantically accurate translations while aiming to maximize organic-rankings of targeted foreign-keywords. Portuguese is spoken as a native language by about 250 million people. It is the official language in 9 countries including Angola, Brazil, Cape Verde, East Timor, Guinea Bissau, Macau, Mozambique, Portugal, and São Tomé. In fact, the Portuguese language is considered to be the sixth most popular first language in the world. In the United States alone, there are over 687,000 native Portuguese speaking individuals. 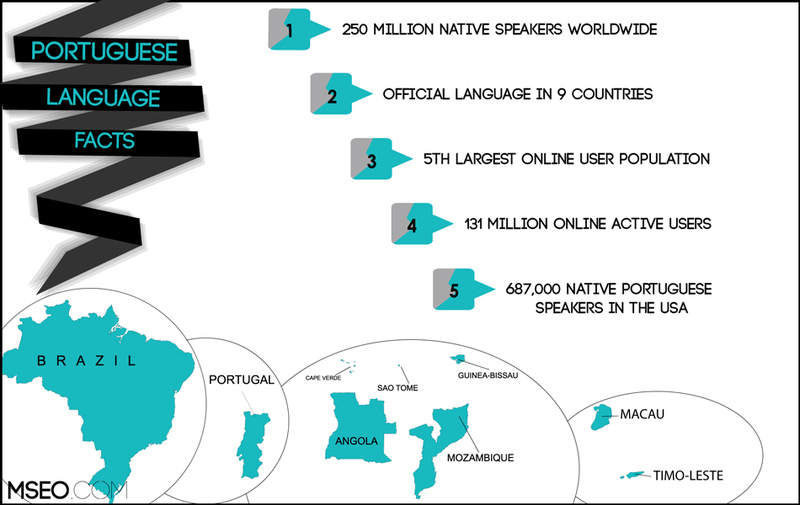 As of November 2015, there are over 131 million Portuguese speaking Internet users around the world (an estimated 3.6% of all worldwide internet users). The 2 most powerful Portuguese speaking countries are Brazil and Portugal. They are both highly involved on an international scale and present in many global business affairs and organizations. Active in the European community and economy, Portugal remains one of the key players in the European Union. Brazil, on the other hand, is the largest country in South America and holds a population bigger than all of the South American countries combined. Brazil is also rich in natural resources and is growing daily in economic power. Due to the presence of the Portuguese speaking population around the world, the Portuguese language should always be considered when tapping into the international markets. Get a quote to localize your website into Portuguese today!